Mike Hill is something of an everything man. He runs a label (Black Box Recordings); he is a record producer (Isis, Hot Cross, Burnt by the Sun); he has played in notable bands - Anodyne anyone? ; and he is currently playing in Versoma and Sino Basila. I recently had the chance to grill Mr. Hill about what he has done and what he is doing now. Scene Point Blank: What lead to the decision to dissolve Anodyne? Mike Hill: We were a band for over eight years; it was just time to call it quits. The three of us, working together at that juncture, were pretty much tapped out. Scene Point Blank: Do you miss it or are you glad to be moving on with new projects or both? Mike Hill: Of course I miss playing with those guys. When we were all on the same page and working together, that band was a blast to be in. Scene Point Blank: Any plans on a full discography release to cover what The First Four Years did not? 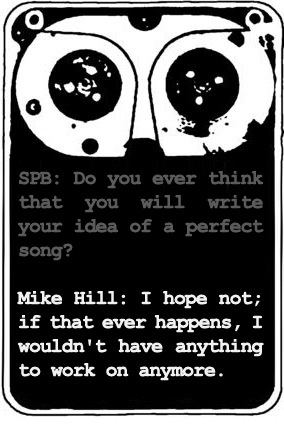 Mike Hill: Not really; there isn't really that much material left over outside of the LP's and EP's. The only â? ?rareâ? tracks that don't appear on that discography are the split with Defcon 4 and the Black Flag cover that originally appeared on the Black on Black record that Initial put out a few years ago. What I would really like to do is make our entire catalog available for download off of the Black Box site. Scene Point Blank: What do you have on tap for Black Box Recordings in the near future? Mike Hill: The next thing that is coming out is the Sino Basila EP, that's a side band that I do with Robin (Versoma drummer) and Hunter (former Wetnurse bassist). I'm pretty stoked on it; it's like side two of My War type bumout-core. There are some other things in the works but I want to hold off talking about them until I have better intel. Scene Point Blank: Are you planning on doing more engineering and or production work? Mike Hill: Lately, I've been doing a lot of recording work. Primarily out of Translator Audio, but I've been doing a bit of â? ?on-siteâ? recording with my personal set-up. I just finished tracking some new material by Burnt by the Sun with this set-up. Scene Point Blank: How did the Burnt by the Sun collaboration come about? Mike Hill: I've been tight with those guys for a long time; especially Dave. He called me up one day and asked if I would be into tracking two new songs for a 7-in that's coming out. I was definitely into it. Scene Point Blank: Was working with them rewarding? If so, why? Mike Hill: Definitely. Those guys are top-notch musicians so it was a pleasure working with a band that can play and have developed their sound. Scene Point Blank: You did production recently on the latest Hot Cross album and there were some issues. Would you care to elaborate? Were you disappointed by the outcome of these sessions? Mike Hill: I'll just lay out the facts and you can reach your own conclusions. We spent about a week working on the recording. Billy called me and said that they wanted to remix some of the material; not an unusual request, that kind of thing happens a lot on full-lengths. I couldn't really book the dates within the window that they wanted so they decided to have Josh Jakubowski (former Hot Cross guitarist) do the re-mixing. Still not a problem. I understand that they are on a tight schedule ad I don't have any ego about people re-mixing my work. Around this time, the lineup change with Versoma was in effect. Drudy was out and we had a new rhythm section. My friend Dave called me up and told me that he read on Lambgoat.com that Hot Cross was re-recording the record. Mainly, I was disappointed that Drudy didn't try to contact me to discuss any of this. Ultimately, it's their decision to do whatever they want to do. Drudy and I have since talked about all of this and everything seems cool. Scene Point Blank: How do you prepare for a recording (producing or engineering) project? Mike Hill: The best thing for me is to listen to demo recordings of the material before we go into the studio so I can put together ideas of how I'd like to track the band or how to break things down as far as overdubs and accent tracks. I always tend to track more than I need; I believe it's better to have too much than not enough. Scene Point Blank: What band that exists today would you most like to record and why? Mike Hill: Neurosis. They have a very focused vision and seem to be open to trying out a lot of different ideas. Scene Point Blank: If you could choose any band from the past, who would you want to record? Mike Hill: Black Flag. I don't think you would actually "produce" a band like that. You just sort of document the intensity of their performance. Scene Point Blank: The Versoma record was recently released as well. How has the response been? Mike Hill: So far, so good. Scene Point Blank: Would you consider the Red Sparowes/ Daughters tour that you did successful? Mike Hill: Totally. First of all, it was the easiest tour that I've ever been on because tons of kids come out to see both of those bands so there was no pressure on us to draw anyone. Also, it seemed like a lot of people had already heard the material and were open to checking us out. It was pretty amazing for a first tour. Scene Point Blank: You are also doing a few dates with Isis on their off days from the Tool tour so it seems Versoma is progressing nicely. Are you happy with the progress that you all have made? Mike Hill: I can't be happier with how things are going. So many cool things have happened to us. Scene Point Blank: Do you have much unrecorded material with Versoma? Mike Hill: We have two brand new songs that are currently in the set. Jamie and I both have at least an album's worth of material that in various stages of completion that we're working on. Scene Point Blank: If so, any plans on releasing it in the near future? Mike Hill: Robotic Empire has expressed interest in doing a full-length with us. I'd also like to release some of the material as 7-in's or splits. Scene Point Blank: Does Versoma write collaboratively or is there a primary songwriter? Mike Hill: It's about 90% collaboration. Scene Point Blank: Can you describe the Versoma writing process? Mike Hill: Typically, either Jamie or I will have a collection of riffs that would be introduced during rehearsal. Over the course of several practices, more layers of stuff would be added: bridges, endings etc... This is true with the exception of two songs: "Come in Alone" was written beginning to end by me, and "Gods and Queens" was written by Jamie. This is a fairly new concept for me. In Anodyne it was much different. I relied on those guys for arrangements. There were a few exceptions where Josh wrote some of the main riffs. Scene Point Blank: Are you the primary songwriter in Sino Basila? Or is it more of a group effort? Mike Hill: Once again it's more of a collaborative effort. But I think it would be accurate to say that I am the "primary" songwriter. Scene Point Blank: How does (or does) the writing process differ between your two current projects? Mike Hill: In Versoma, there are two very strong personalities that both express themselves similarly i.e. Jamie and I both sing and play guitar. We both bring ideas to the table. Without each other's input, the songs would sound completely different. In Sino Basila, it's more like a Hendrix Experience trip, where one basic idea is being put forth and the other elements are reacting to it. Scene Point Blank: What record has most inspired you to write music? Mike Hill: In My Head by Black Flag. Scene Point Blank: Do you think you have come close to honoring that inspiration? Mike Hill: There were moments on the last Anodyne record that were almost as satisfying, at least to me. Scene Point Blank: Have you ever truly been satisfied with your songwriting? Or do you see it is a constant perfection (an almost completely out of reach goal) that you strive for? Mike Hill: There is always room for improvement. Lately, I've been able to listen to stuff that I've written and not wince. Scene Point Blank: Do you ever think that you will write your idea of a perfect song? Mike Hill: I hope not; if that ever happens, I wouldn't have anything to work on anymore. Scene Point Blank: If you had to choose a favorite song of yours that you had written, what would it be and why? Mike Hill: That would be "Arctor" off of Anodyne's last record Lifetime of Gray Skies. I listened to after not having heard it for a long time, years, and it made me want to smash everything in sight. Scene Point Blank: Do you have any last comments that you would like to make? Mike Hill: Support your local organic farmers.